While surfing Tumblr, I came across a post appreciating Riku and his magnificent character arc, and about how the poster thought he should be the main character- and that got me thinking, what if he was supposed to be? I'm talking strictly in-universe speculation, here. He was the only one of the trio officially chosen to receive the keyblade, and just like TAV’s keys, the Kingdom Key matches with all of his color schemes on par with/better than it does with Sora’s(the main exceptions being the outfits he gains from other people- Xehanort's dark mode and the Org XIII cloak). Plus it’s not just any keyblade. The Kingdom Key is somehow super significant to the KH universe as a whole. 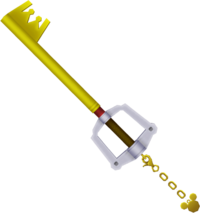 Aside from being easily the most simplistic in design, it’s the only keyblade with a confirmed Realm of Darkness counterpart (Lightseeker, AKA Kingdom Key D) and it visually makes up a large portion of the χ-Blade. But, everything changed when the Heartless (nation) attacked. That night on the island, the strength of Riku’s heart wavered and the Kingdom Key moved down the line to Sora, setting Riku down a path to redemption made darker in the presence of Sora’s light. Eventually Riku got his own keyblade that more adequately portrayed his journey and struggles. But what if he hadn't been passed in the first place? Assuming nothing else changed up until the Kingdom Key made its choice, we'd be faced with a severely different series. I can't say that Riku would make the same decisions as Sora, or even be in the same situations. But I do know his story of redemption and growth from keyblade-rejected pawn of darkness to the next Keyblade Master is very fitting of a universe saving hero. B: There is something deeply special about the Kingdom Key and I refuse to believe it's just because it's the brand mascot"
A: Yes, I believe that is destined for some greatness and that he will certainly serve a pivotal role in KH3 (and most likely the rest of the games). I guess the question is will his role ever be more important than Sora's in a numbered title? 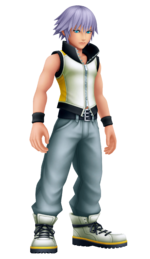 Yes, Riku had the spotlight in KH Reverse/Rebirth and in KH3D, but will he ever become more important that Sora in the main games? B: I think there is something special about the Kingdom Key too. I think it's cool that it let Riku hold it while Sora was unconscious in KH3D. But that is where it ends with Riku I think, nothing much more to it. 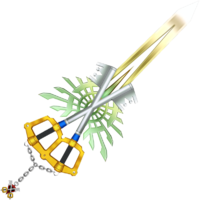 However, I can't help but think that the Kingdom Key and the Kingdom Key D could perhaps be connected to the X-Blade from KHBBS. If you don't believe me initially, consider the X-Blades appearance. What are your thoughts on this? Nice eye there seeing how Riku and the Kingdom Key have similar color schemes. A: Riku was definitely supposed to be the main hero. He just let too much darkness in and Sora was standing there so he got the Keyblade instead. Seeing what he's been through in the series he will, of course, have a big part in KH3. I can see him being the sole main character in at least one game in the future as well. B: I've always liked the Kingdom Key and I think it has a special quality too. And like you guys have pointed out, it is the primary part of the original X-blade so there's that too. But, everything changed when the Heartless (nation) attacked. Until further stated I would think the Kingdom Key is more symbolic of the series rather than important. Because even though we've only seen one dark realm keyblade we do know that the only difference between them and normal light ones is origin. If the only difference truly is origin then that would mean, like the light, there should be as many dark keyblades as there are people that can use them. It also doesn't help to me that the Xblade is made up of two kingdom keys. Not a kingdom key and a kingdom key D but two of the kingdom key variant. That's just side topic though. Definitely agree with the rest and I'd never rule out the KK becoming important but I'm on the fence until more to it actually shows up. It also makes one wonder if the KK is the keyblade of Riku's first foreteller incarnation then what's the Way to Dawn of? I think in the absence of his destined keyblade, Riku's heart forged him his own unique key. Aside from an obvious extrapolation of his Soul Eater, the Way to Dawn is highly representative of the state of Riku's heart- and even mix of light and darkness. Now I'm wondering how often a new wielder's heart forges a new keyblade instead of reusing an existing keychain from a connected heart. For example, it's pretty believable that Terra and Aqua's base keyblades could have been inherited from their forteller past lives, but Ven's Wayward Wind seems optimized for a reverse grip. Did Leopardis have the same fighting style? Or, did Ventus get a new or tweaked design to match his grip? When it comes to TAV the keychains may be the key. They're getting the same keyblade but its appearance changes with the keychain to reflect the current self.